Last week I sat down with the CEO Technician over at CEO.CA to talk about my methodology in the market, how I utilize sentiment, what I currently see in Energy, Metals and Interest Rates and to talk a little bit about our business, both the hedge fund and research products. In the financial blogosphere, the cream rises to the top. JC Parets, Founder and President of Eagle Bay Capital, LLC, is one of the clearest voices on Wall Street today. 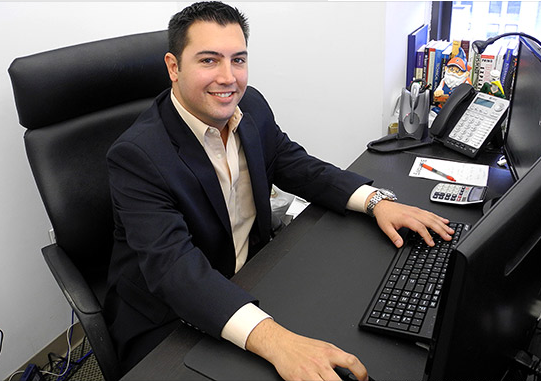 As author of the popular technical analysis blog, All Star Charts, Parets, 32, has established a significant following (You may know him from CNBC and other frequent media appearances). We respect JC as a disciplined trader and market analyst; he is especially strong at risk management and often finds unique insights utilizing inter-market analysis. We had the opportunity to catch up with J.C. the other day and so without futher ado, here is our interview with J.C. Parets talking global markets…It’s great to have you here J.C., what can you tell us about your methodology for the markets? What do you look at on a daily basis? Sure, the only reason why we are in the market is to make money. We aren’t journalists, we aren’t economists, the only reason we are in the market is to make money. So we are being very selfish in that respect, to make money for our investors. In order to achieve this goal I am constantly going out there looking for risk/reward opportunities that are very much skewed in my favor. We are looking for opportunities where for each $1 of risk we are able to make between $8-$12 in profit, so we are looking at 1:8 risk-to-reward opportunities. We are very picky. We are able to do this because we look at such a broad array of markets and asset classes. We run a lot of spreads as well, where we can be long one market and short another etc. So for example if we want to be neutral precious metals as a group we can be long palladium and short silver, a trade which has worked very well for the past couple of years. A few of the tools we are able to use to find the best risk/reward opportunities, obviously we are analyzing price because it is the only thing that pays. When we are looking at momentum I use a 14-period relative strength index, I do a lot of relative strength analysis, so not only on a particular stock relative to the overall market but also for example we will look at emerging markets as a group and compare countries within the emerging markets. So for example India has been showing relative strength compared to emerging markets as a group, Russia has been showing a lot of relative weakness compared to emerging markets as a group. We also do a lot of seasonal studies. We have some proprietary models that we incorporate because during different times of the year certain markets behave in different ways. Not just the stock market, but commodities, fixed income, and currencies as well. And we also implement traditional pattern recognition, something that we kind of take for granted, looking at behaviors of the market in different patterns. As a technician that’s what i’m really focused on, price and pattern recognition. I also do a lot of Fibonacci analysis to come up with price targets and to manage risk. How do you utilize sentiment in your market analysis? More often than not there isn’t any valuable information we can take from sentiment. I only really start to pay attention to sentiment when we’re at extremes. For the most part sentiment is a bunch of noise. For example in the US stock market right now I believe that sentiment is just a bunch of noise – sentiment has been relatively bullish and we have continued to make new highs, but we have not seen extremes in bullish sentiment. Another example are metals, sentiment has been extremely depressed yet prices have continued to make lower lows. This sort of action is classic bear market stuff. Could we see a counter trend rally in metals? Sure. But is there enough evidence to say that this multi-year bear market in metals is over and we’re going higher? It’s way too early to say that, but short term we could definitely get another counter trend rally. What are you seeing in crude oil after the big sell-off the past few weeks? I really like to wait for the perfect storm in terms of sentiment, price, and momentum before I get involved in a market. In crude we are really only at extremes in terms of sentiment, there is really nothing else to suggest that now is the time to be buying. Are we close to a bottom? Yeah, I’ve got to believe that we’re close and the mean reversion process is likely to get going soon. I could see oil getting back to the low-to-mid $80s on a rally but we must remember that this will be a counter trend rally. Oil has been in a bear market since it topped at $147/barrel in 2008. One of the best trades you’ve had during 2014 has been your long US Treasury Bond position which you’ve had on since January. What do you see from here and when will we know that we’ve put in a bottom in yields? It’s a process and that’s what I think the academics and the economists don’t understand. It’s something that takes time and it’s not going to be a single event that’s going to be like “BOOM!! that’s the bottom in rates” and then we’re going to have a multi-decade bear market in bonds. I like to look at history, we can learn a lot from the past behavior of the market, especially a market like the US Treasury Bond market, a market that’s been trading for over 200 years. Historically speaking a bottom in interest rates takes 10-15 years to happen. I see zero evidence that interest rates are heading higher, in fact everything we were seeing back in January that made us bullish bonds we are still seeing now. So to be clear, you are seeing no signs that we are near a bottom in long bond yields? To the contrary, everything i’m seeing is telling me that interest rates are going to stay down. Look what’s happening in the stock market, what are the best performing sectors year-to-date? Utilities and REITs. This is yet another indication that rates are staying lower. The only people saying rates are going higher are the economists and the journalists, people who don’t put any money to work. What are your favorite sectors and asset classes out there right now and what are your favorite charts? 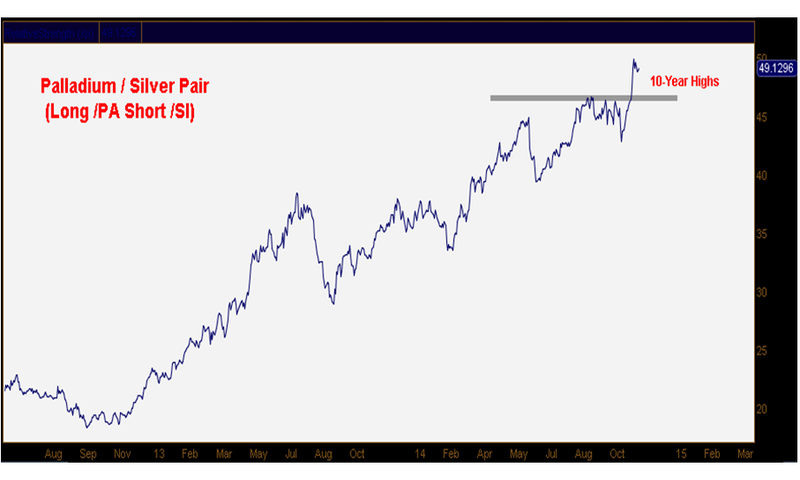 We want to be in utilities (XLU) and REITs (IYR), these sectors are breaking out to multi-year highs. Tactically from a risk/reward standpoint it doesn’t get much juicier than this; we have a target on IYR of 85 and we only want to be long above 76, if it breaks back below 76 we will be out. We also really like being short the Canadian dollar via being long USD/CAD. This pair put in a huge bottom and as they say “the bigger the base, the higher into space” – we have a 1.17 target for USD/CAD. We are targeting $47.50 on KRE and with two weekly closes above $40.50 I will get long. Thanks, J.C. Now what should our subscribers know about your fund and research services? ABC News: Do We Buy Gold or other Metals? This week I was over at the ABC studios on the Upper West Side to talk about Gold and other metals. I think it’s important for investors to define their goals and time horizon in the market. Structurally I see little evidence to suggest that a historic low was made last month in Gold and a new structural bull market has begun. Short-term I think we can see a bit more upside, but bigger picture I think we can be patient before calling this a real bottom. I believe there are better ways to be positioned in the metals space. One of the more interesting developments in recent weeks is the increased selling pressure in precious metals. Gold and Silver are two metals that we’ve wanted to be aggressively short for some time now. This has worked out well as prices continue to hit multi-year lows. 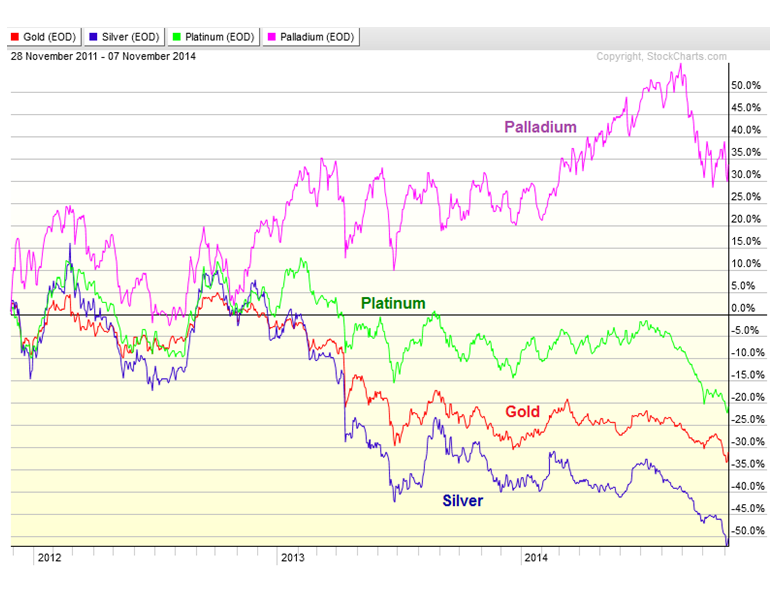 But one thing that stands out from the group is the continued outperformance from Palladium. When we review our commodities charts, this one definitely stands out from the rest. It’s no wonder that with Silver down almost 20% this year, and gold and platinum also down, that somehow Palladium is up 8% for 2014. The pair trades continue to work. See our list of Premium Research Products here and find the one that is best for you! On Friday I was over at Fox Business chatting with Liz Claman about the Stock Market. I think the biggest thing that I don’t hear people talking about is how there isn’t anything better than the S&P500. On a relative basis, none of the other countries can compare, especially Emerging Markets who continue to underperform. Latin America specifically is one of the worst relative to the United States. We also discussed precious metals and how our downside targets in Gold and Silver still have not been reached. Palladium on the other hand continues to be the best of all the metals and proved that once again rallying 1.55% last week while Gold and Silver were down 4.7% and 6% respectively.